2012 Bucklin, Ancient, Old Hill Ranch, Proprietary Red, Sonoma Valley. Will Bucklin’s latest Zinfandel blend from the historic Old Hill Ranch is a stunner, this is an awesome wine and one of the best reds of the vintage in California! First planted in 1852 and becoming California’s first vineyard to be planted with Zinfandel, Old Hill Ranch in Sonoma Valley, not far from Glen Ellen has the state’s oldest Zinfandel vines and this bottling features fruit from vines that were planted in the 1880’s! The Old Hill Ranch is more than that, it is also a Heritage Vineyard with dozens of varietals inter planted making an intriguing palate of complexity and diversity, much like Bedrock, the vines at Old Hill Ranch are living history and a tribute to California terroir over mono varietal labeling, this was the old school way of doing things in the state and it is nice that we can still cherish and taste the past and the future in one one. Zinfandel plays a big role, this long lost Croatian varietal also known as Tribidrag (not Plavic Mali as once thought) or known by Italians as Primitivo, but it is not the only story of these heritage sites with many black grapes playing a part too, like Alicante Bouschet, Petite Sirah, Grenache, the Mission Grape along with many others, and even a few white grapes thrown in too, all this adds to the great tapestry that forms these wines, especially Bucklin’s Old Hill Ranch Ancient. I have tasted the 2012 Ancient on three occasions now, it is very impressive stuff, in fact in a recent panel it went up against the fine and highly rated Domaine du Vieux Telegraphe Chateauneuf du Pape and in my opinion came away the clear winner! 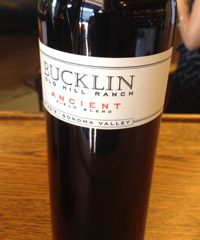 The 2012 Bucklin Old Hill Ranch Ancient starts with a burst of raspberry, floral tones, bramble/briar and earthy spice leading to an array of gorgeous layers on the palate with loganberry, currant, plum and frambois leading the attack along with minty herbs, pepper, cinnamon stick, game and anise making a presence as well as cedar, sweet tobacco leaf and dried flowers. Like Ridge, this is a wine that should gain over time and it will be interesting to see how it develops in the bottle, I can easily imagine great things to happen over the next 10 to 15 years, this wine, at this price is a rewarding option for medium cellaring, it is fantastic now, but with patience there should be lovely results. This is full bodied wine, no question, extremely hedonistic, but everything is poised, sharp and structured with supple tannins, a fair bit of natural acidity and remarkable depth and length. The alcohol is about 15.4%, but you’d be hard pressed to feel it, if you are honest, and there is good ripeness and pleasure, though not cloying or syrupy, this is not a candied Zin or porty wine by any means, and it should age well for another decade at least, this is spectacular California wine with a glorious history and future full of joy ahead of it, drink from 2015 to 2020.